environmental coverage including sediments, leaching, runoff and drainage related to within-field spatial variability. If you consider submitting your researches to Precision Agriculture, please send your manuscript in an original editable file (.doc, .pdf) to the email: elodie.tronche@springer.com. 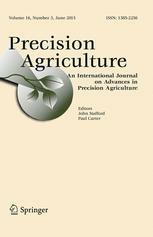 For more information about submission: http://www.springer.com/life+sciences/agriculture/journal/11119.